You may not be thinking about basketball in the middle of summer but one Liberty Slots Casino player will always think of hoops when summer rolls around after winning $46,000 on Money Shot, a popular basketball-themed slot game from WGS, last week. Jason S. said he started playing around 9AM, mostly because he was kind of bored. It had been hot in California where he lives so he started playing the Winter Wonderland slot just to see if it would cool him down! He did OK, but when he started playing the basketball game, Money Shot, things really started to heat up. Free spins on Funky Chicken slot from WGS available at Liberty Slots Casino. Jason started with a modest $10 wager across the game’s 20 pay-lines but, as the wins started piling up, he started to risk more. It wasn’t long before Jason hit three scatter symbols which triggered fifteen free-spins where all wins are tripled. One free spin won $22,000 and several more after that paid several thousand each. He benched himself with a closing balance in excess of $45,000. “I’ll be putting this to good use, there are some things I need for the house but I may treat myself to some NBA tickets for the upcoming season”. “We should have left Jason on the bench today,” joked Mark Ramirez, casino manager at Liberty Slots, “Seriously though, congratulations to him. He played the game very well and it was a smart move, picking a game out of season you can get very lucky”. Liberty Slots has a wide selection of online slots and table games from Wager Gaming Technology in its download and instant-play casino. 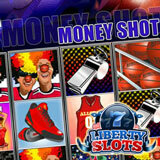 Thirty of its most popular games are also available in its mobile casino (http://www.libertyslots.eu/mobile-casino). Using coupon code CHICKENSPINS, players can claim a 200% bonus that includes 100 free spins on Funky Chicken – another game where scatters trigger a bonus round.